The original inhabitants of today's Springfield, MA found their lives and cultures altered with the onset of European colonization. The Connecticut River Valley was formed 360 million years ago when the North American and European continental plates collided. Over the next several million years, erosion and periods of volcanic activity slowly changed the shape of the mountains, while rivers began to carve their way through the space between the mountains. Although sharing a cultural and linguistic heritage, the First Peoples of what is now the area around Springfield displayed significant diversity. One of the central issues surrounding the creation of a Native American history in the Connecticut River Valley stems from the paucity of records left by these subjects, as opposed to the multitude of documents from English settlers. Well-known figures, such as William Pynchon and his son John, fill historical records with their own experiences and interactions with Indian tribes that often reduce their adversaries to passive characters who impeded colonial expansion and international trade. War between European colonists and the indigenous people of New England broke out in 1675. 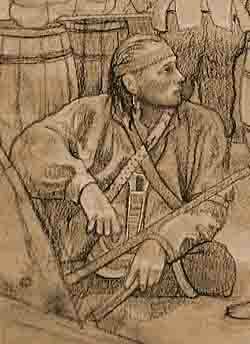 After two years of fighting and thousands killed in Massachusetts, the war ended with the death of Wampanoag leader Metacomet, called King Philip by the English. During King Philip's war, the town of Springfield was burned to the ground.